Two Snails was born more than a few years ago, at a time when Mr L was very unhappy at work and desperate to get out of the rat race. He saw selling up and going on the road as a way of living cheaply if he abandoned his desk early. Since that time ideas moderated but we bought Brunhilde as a proof of concept trial, to see if we thought we might go long-terming at some point. Life had moved on and a way had been found to retire early without having to actually sell the house. So far, so good. 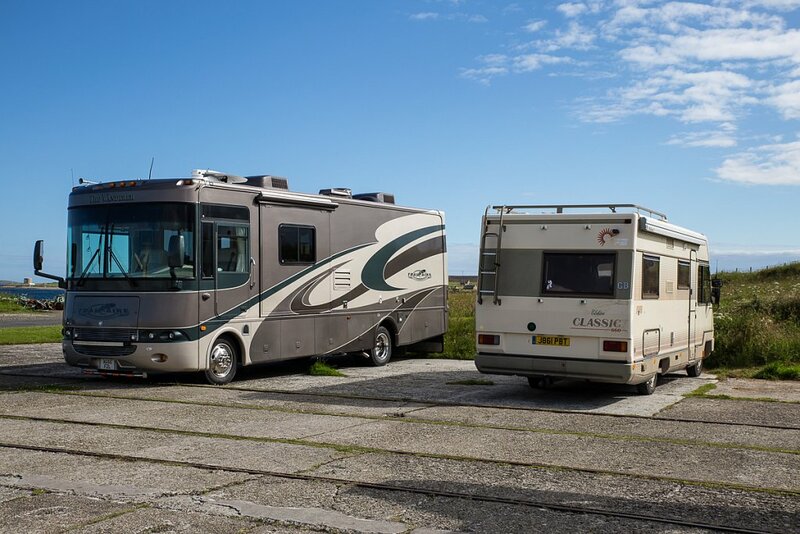 The working week is now down to three days and we have a mobile home to take us away for weekends or longer periods. A new plan was formulated, to leap into the van come Retirement Day and drive down to France for a month, adding a week's journey on either side of that. The notion of full-timing then raised its head once more. We have finally made a commitment to the idea. It is more than an Idea. It is more than a Plan. It is actually a Happening. It cannot happen before September this year and may not happen for some time thereafter as it is all a little in the lap of the Fates. All that we are doing for now is actively working at de-cluttering the house and preparing it for sale. Not in any half-hearted way either - things are already moving out of the door and my cash jar has actual notes in it. I have made a web site for listing my items for sale as I go along. Emptying the house is my task. Mr Snail is spending a lot of time in researching what type of van would be the best option for us. One feature that we are seeking in our new van is a fixed island bed. The one thing that Brunhilde has taught us is that we cannot go on, ageing as we are, struggling in and out of a French bed and climbing over each other. That being so, we have agreed that six weeks in Bruni is really beyond us and so we have cancelled plans for the French trip in the Autumn. Until we go full-time we'll take shorter breaks and stick to the UK, we think. We will get passports sorted asap however as we may need to venture out of the UK in order to buy the right van. We're thinking (one of the smaller ones, up to 9 metres) American RV. There's a turn-up. I have hitherto loathed the things. I find them tasteless and over-stuffed. After a week or two of concentrated Googling however, I now agree with the boss that the extra space afforded by a slide-out or two is highly desirable. Speaking for myself, I find the RVs are simply lighter and brighter than the European style of Motor Home, with its dearth of window space. There even exist some RVs that are not hideously OTT! Who'd a' tho't it? Also, Euro-style vans tend not to offer an oven. No oven for a weekend or a week or two in Summer is one thing, as a full-timer, quite another - so far as this cook is concerned. is currently for sale on eBay. You can see how much more space it would afford than poor little Brunhilde standing beside. The Hoy vehicle is a little over-priced compared to similar currently available vehicles and is also a prime example of the Middle-aged Sitting Room style that I abhor. But it is handy. Very much so. It didn't sell on Buy It Now at the weekend and has been re-listed at a lower price but on a 3 day listing, with sale completion demanded in 48 hrs or something like that - totally infeasible for us. If it fails to sell again we might be able to go and look at it if re-listed a third time. It's still pricey and fails to tick all the buttons but it's a straightforward option. Currently I favour a Minnie Winnie or a Georgie Boy, though today I discovered the Thor range and am much enamoured of the practical approach. It is not easy. This will be our living space for at least ten years, we hope. Thereafter we may wish to live in it as a static if we cannot afford to buy or rent a house. It is essential that we get the right space that fits us and our intended lifestyle. We should take our time and not go off half-cocked, excited over some "bargain" or local purchase, just because. So. In summary - It's happening but we don't know when. Work ceases end of August. Then we can put the house on the market. We could leave buying a new van until we have the funds from the house but if the house is slow to sell (which could easily be the case) we can wait for some lump sums to come in and use those. On the otehr hand if the right van comes up too soon, we can rob our savings and top up with a little Financing until the house sells. If the house is not sold but we have the van, we can always leave and go full-time, leaving the sale in the hands of the agents. So many scenarios - six months or two or three years before we can go. Kismet will decide. We will go with the flow, as always.